Most companies specializing in development boards may sell a few accessories for their boards, but usually leave product design to their customers. Next Thing Co. does that too, but the company also produces some products like PocketCHIP portable Linux computer & retro game console, and more recently Dashbot, a voice controller assistant for your car’s dashboard powered by CHIP Pro module. The bot runs mainline Linux, source code will be available, as well as hardware design files making open source hardware (likely minus CHIP Pro module itself). 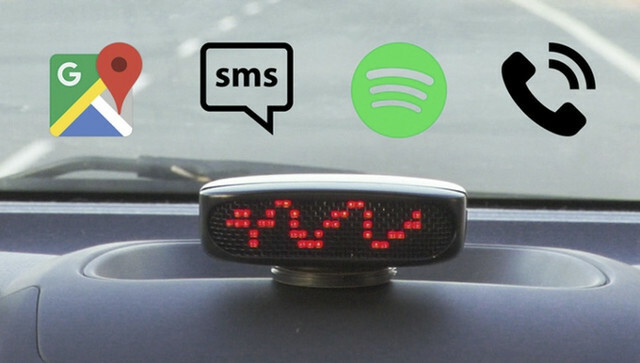 Once you’ve stuck the magnetic adhesive mount to the dashboard, and placed Dashbot on top, you can connect it to your car stereo via Bluetooth or your car’s auxiliary jack. Wait what? 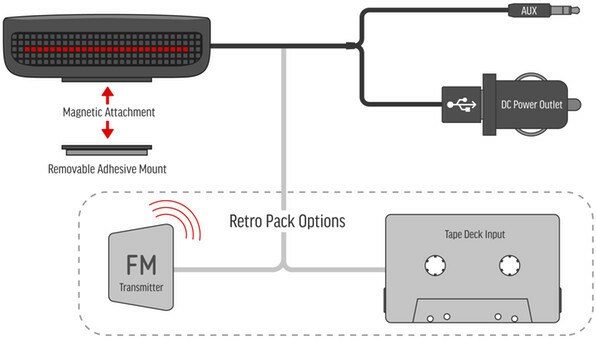 My car does not have any of those two connection methods… But no problem as the company also offers a Retro Pack adding an FM transmitter and cassette adapter for older cars. The main goal of Dashbot is to keep your smartphone in your pocket, and control it with your voice in order to keep your eyes on the road. But you’ll still need your phone, and after installing Dashbot app on your Android 5.0+ or iOS 10+ smartphones, you’ll be able to tell Dashbot to start playing music from online services like Spotify, Soundcloud, Google Play Music, and others, or tell it to “go home” and it will show the directions from Google Maps on the red LED display, and of course you can also answer phone calls, and reply to SMS. Dashbot “AI powered hands-free car kit” launched on Kickstarter a few hours ago, has already raised over $50,000, and I’m confident it will surpass its $100,000 funding target. A $49 pledge should get you Dashbot, a power port for your cigarette lighter and an AUX cable, but if you have a car with a stereo that does not come with Bluetooth nor an AUX IN jack, you can get the Retro Pack for $65 with an FM radio/cassette player adapter. They also have rewards with an OBD-II dongle, and bundles with multiple Dashbots. Shipping adds $9 or more depending on rewards and destination, and delivery is planned for July 2017. Surely AUX should be part of the Retro Pack Option these days? where can I purchase dashbot retro pack for my Toyota lucida people carrier Thank you.